Felicia Vandermolen (center) of the Nitro Live Icecreamery doesn’t only make ice cream using liquid nitrogen, she also conducts science experiments in school classrooms. 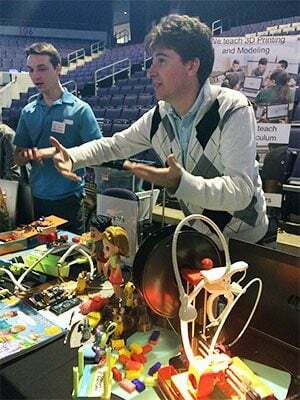 Nitro Live Icecreamery was one of the exhibitors at Wednesday’s STEM Innovation Spotlight at GCU Arena. 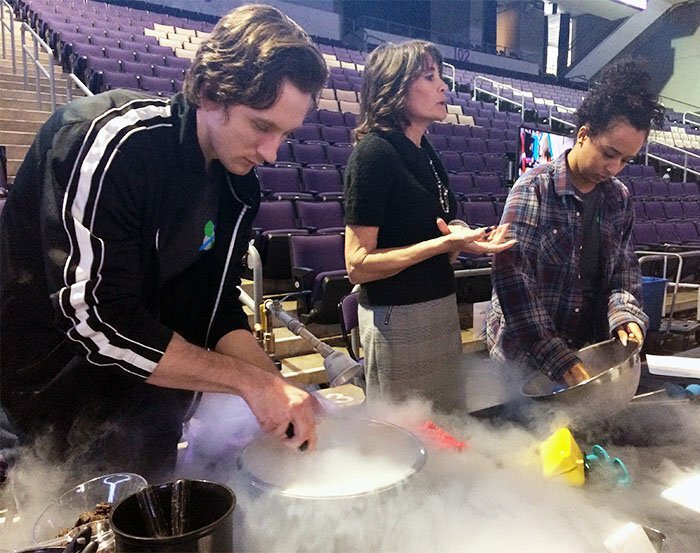 And the twain did meet Wednesday at Grand Canyon University‘s STEM Innovation Spotlight, where Nitro Live Icecreamery owner Felicia Vandermolen was busy pouring cream, stirring in berries, then dousing the whole confection with a shower of liquid nitrogen. 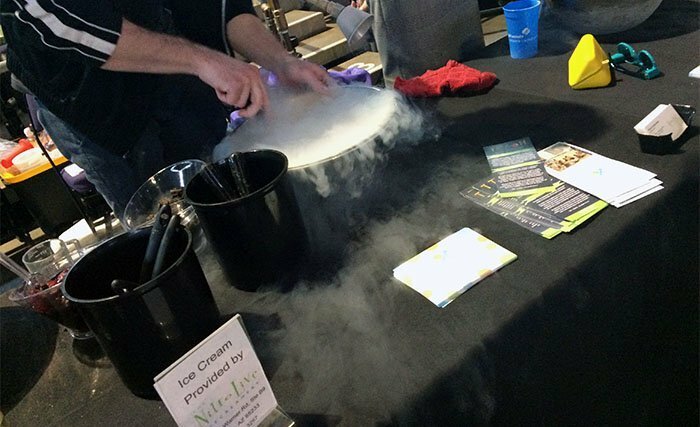 Some vigorous stirring and a minute or two later — and with a nitro fog cascading from the bowl — ice cream was up and ready for tasting at the Strategic Educational Alliances event at GCU Arena. It was where about 200 educators and educator-friendly organizations gathered to share ideas, network and advance science, technology, engineering and math as more than just a much buzzed about academic term but as the way to meet the needs of a more STEM-focused world. Engineer Nestor Llanos speaks to educators about bringing 3D printing into their schools. The Dream Factory creates 3D printing kits for schoolchildren. Vandermolen didn’t just make ice cream. She also made science — something the ice cream place brings into the classroom. “We’ve been working with educators on their time off who have been helping us create experiments,” she said. They’ve developed a curriculum based around seeing liquid nitrogen in action. The experiments are based on Arizona science standards and include such subjects as learning about the different states of matter. This is the third year for the STEM Innovation Spotlight, a science-on-parade event that kicked off with talks by GCU President Brian Mueller and keynote speaker Princess Young, program lead with the U.S. Department of Homeland Security’s Office of Cybersecurity Communications. 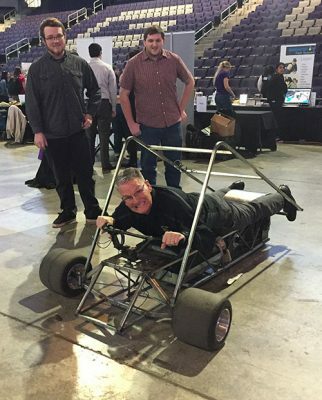 The event also included about 30 conference exhibitors, a GCU engineering labs tour, STEM presentations by various educators and a procession of exhibitors who had 90 seconds to summarize what they do. “It (the conference) is just to provide a STEM network between STEM organizations and educators – to be able to share resources for teachers to use in their classrooms that are predominantly free and relevant and hands-on,” SEA Executive Director Kathryn Scott said. Besides the Nitro Live Icecreamery, STEM Innovation Spotlight attendees could visit with the Dream Factory, which teaches 3D printing and modeling. The Dream Factory offers a 3D printing kit teachers can use in the classroom. Students assemble the printer themselves — or they can be ordered already assembled — and then can use the printer to build other projects. The 3D printers are manufactured locally and use open source codes, which means they are shareable. 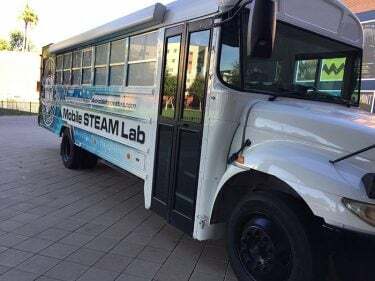 Avondale Innovates’ Mobile Steam Lab, a Spotlight Award winner. “It’s distilling it (3D printing) down to a kindergarten level,” said Dream Factory teacher and community liaison Chris Dastan, who emphasized that the organization wants to help children own their educational process by teaching them to build. Debbie Kovesdy was at the conference to tell fellow educators about Generation Tech Support, a tech support business at Seventh Street and Thunderbird whose specialists range in age from 13 to 22. “We’re taking shy kids with technological skills and we’re giving them the soft skills for the industry,” said Kovesdy, Generation Tech Support’s CEO. The business got its start with Shadow Mountain High School GenYES students and Kovesdy, their teacher. She recognized the strong technological talents in the students she was teaching. “They know a lot about technology but also know how to problem-solve and troubleshoot, and that’s a skill set,” she said of the business, which at just 14 months old already is self-sustaining. Scott said one of the new features at the conference was the Spotlight Awards. Winners were given time on the stage to tout their STEM and STEAM (science, technology, engineering, art and math) efforts. “We wanted to shine a light on or put a spotlight on exemplary STEM programs and STEM schools,” Scott said. One of the Spotlight Award winners was Avondale Innovates and its Mobile STEAM Lab. The laboratory on wheels, a vision in blue with computer coding peppering its exterior, is a product of the Avondale Elementary School District. The Welding Program at Skyline High School in Mesa won a Spotlight Award for its go-kart. Another Spotlight Award winner, the Welding Program at Skyline High School in Mesa, Ariz., brought along “our outlook on a go-kart,” said Austin Wilson, one of about 13 students who worked on the vehicle. The driver of the souped-up go-kart lays on his stomach to guide it. The go-kart on steroids was created for the Welding Thunder Arizona welding competition. In the competition, teams have 20 hours to build their project. Then on the day of the event, team members have four hours to add secret components to customize the build before the time trials. Young, who grew up in a household of educators, used her keynote speech to talk about how she got into cybersecurity. Her degree is in business management with an emphasis in human resources. When she got an offer to go into a cybersecurity program for her master’s degree, she decided to try it out. That led to an internship with the Department of Homeland Security and her current position. Keynote speaker Princess Young, program lead with the Department of Homeland Security’s Office of Cybersecurity Communications, talked about how she got into cybersecurity. And she gave some sobering statistics about the need for cybersecurity professionals: 1.8 million cybersecurity jobs will need to be filled by 2022, and only 11 percent of all cyberprofessionals are women. The STEM Innovation Spotlight and similar events are joining educators in trying to change that outlook. 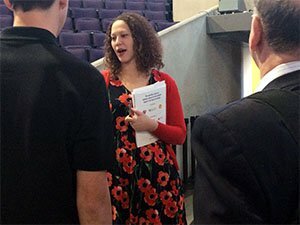 Mueller shared GCU’s dedication to the STEM fields, mentioning that 300,000 square feet of engineering, computer science and information technology space on the campus has been added in just the past two years. He said the University is in the planning stages of another 70,000 square feet at GCU’s Innovation Center. You can reach GCU senior writer Lana Sweeten-Shults at lana.sweeten-shults@gcu.edu. Follow her on Twitter @LanaSweetenShul.